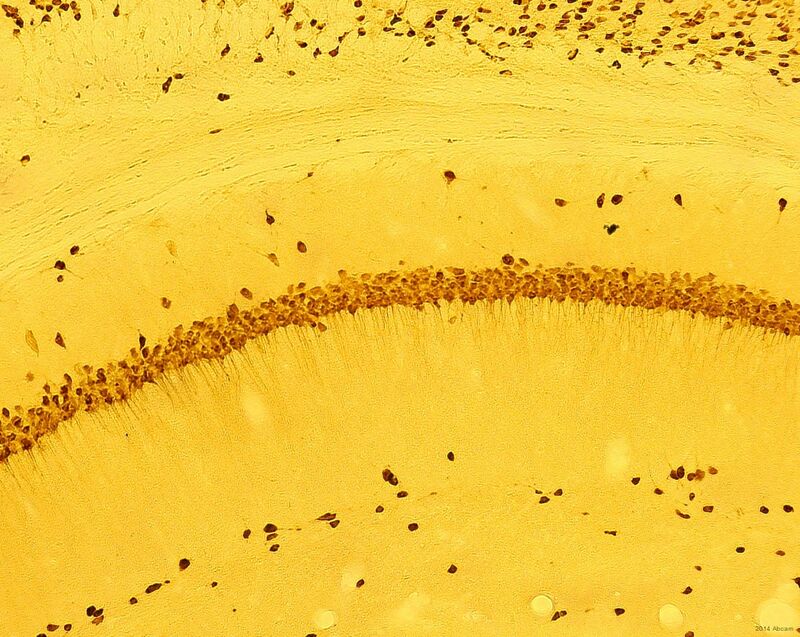 Cornal section through the hippocampus showing NeuN positive neurons. 4% Paraformaldehyde was used to perfuse and fix the brain tissue followed by 20% sucrose in PBS over night. Sections were cut in cryostat at 25um. Tissue was incubated 0.5%Triton-X for permebalization for 30 min and blocked in 10% normal horse serum for 15 min and then in NeuN antibody at 1:1000 in antibody diluent that contains 1%horse serum serum+0.01 kodak photpflo for 48 h at 4C. Subsequently, tissue was incubated in Biotinylated Donkey anti-Rabbit IgG at 1:200 dilution. Tissue sections were then incubated in ABC solution (1:100) for 1 hr followed by DAB reaction to visulaize the immunoreaction product. The brown reaction product inidcates the positive reaction.